Since 1st June he has been the Director General for the new body, and now, just over four months later, more and more pieces of the jigsaw are falling into place. Since this is a new public body, all routines must be created from scratch, for instance all policies which regulate everything from conflicts of interest to travel. Staff has been and will be hired, but it takes time. Most of them had to work their terms of notice before joining, which means activities at Mynak, which the body is known as, did not really get going until the middle of August, with 11 new staff. “What characterises us is a pioneer spirit. It has been hard work and fun,” says Nader Ahmadi about the first few months in the new public body’s life. Creating the new public body was the idea of the former centre-left government. Just over a year ago, it decided to appoint a special commissioner to establish the public body for work environment knowledge. In a press release announcing the decision, the government said part of the motivation was the fact that the social partners – both trade unions and employers’ organisations – have been asking for a public body like this. After the centre-right Alliance government closed down the National Institute for Working Life (Ali) in 2007, research around various aspects of working life became spread across various universities and university colleges. This made it harder to gain an overview of exiting knowledge within the fields of working life and work environments. There has also not been any particular body that could evaluate work environment measures. Mynak is meant to be a centre of knowledge for work environments, and it can monitor the effects of labour market policies when it comes to work environment issues, and follow and promote the development of occupational health services. “I am often asked whether we are getting a new National Institute for Working Life, and explain that Ali was a gigantic organisation with an annual budget of 450 million kronor. We have a budget of 35 million, so we cannot take that role. We are also not conducting any research,” says Nader Ahmadi. He compares the new public body’s role to that of the spider. The homepage will be a portal for the newest work environment research, and Mynak will work together with a network of relevant researchers. They will take stock of relevant work environment knowledge, and also be on the lookout for gaps in the knowledge. If Mynak identifies the need for a certain type of research, its ideas will be passed on to the research funding bodies afa, Forte and various universities and university colleges. One of Nader Ahmadis tasks is to keep open a dialogue with the Ministry of Employment, and guide them too where new research on work environments is needed. He will also stay in touch with the social partners and is already busy creating networks, which means a lot of travelling to Stockholm. “Our role will be that of the spider, who spreads knowledge but also alerts others of what is needed and where there are knowledge gaps. Good research on work environments exists already, but it is not that easy to access it,” he says. 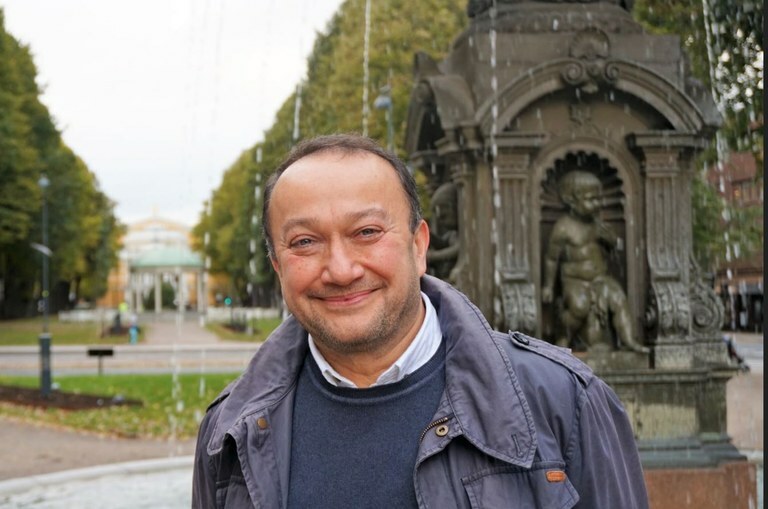 Nader Ahmadi is a professor in sociology and was the vice rector for the Gävle University College before he got the chance to become Director General. He has also been the head of the Faculty of Health and Occupational Studies at the same university college, and that is where he really developed his interest in working life. One of the things the faculty specialises in is stress injuries, an important area which of course will be part of the knowledge that the public body will disseminate. But right now, Nader Ahmadi is particularly interested in the work environment issues emerging in the wake of the rapid technological development. “We will cover both work environment issues found in traditional workplaces and the new ones which emerge as a result of the rapid and fundamental technological development. This is an enormous challenge which we have to face. How will this impact on working life and life in general? Will new robots make humans superfluous? What are the alternatives? And is all innovation a good thing? Nader Ahmadi describes his own working life as something that never stops. He often spends evenings with his laptop in front of the TV, answering emails. Sitting in the sofa at home still gives him a sense of freedom. “For me the work environment is my entire day, and even at night I often dream about something work-related. The border between work and private life is increasingly getting blurred these days, and that’s why the work environment is becoming even more important,” he says. Nader Ahmadi is used to working hard, and is happy with that. For many years he has worked on commission from Sida, the World Bank, Unicef and Save the Children to mention but a few. He has been collected by armoured vehicle in Bosnia when, on behalf of Unicef, he went to investigate children’s psychosocial needs after the Balkan wars, and later concluded that the entire country was traumatised. He has worked with development projects in Caucasus and Central Asia, in Vietnam, China, Laos, Cambodia and Russia. For several years in the early 2000s, he travelled 300 days a year, which made him decide to stop his international work. He has broad, global experience, also from his growing up in Iran and fleeing the country aged 24. What does all of your international experience allow you to bring to this job? “The tasks I have carried out have given me perspective. It has helped me a lot – it is easier to deal with personal setbacks for instance. Things are rarely black or white, which means I find it hard to judge. Most things can be done, and this helps me as a leader. I dare make decision,” says Nader Ahmadi. The public body has also been tasked with following and disseminating knowledge about work environment research mainly taking place in the Nordic region, but also in the rest of the EU. Nader Ahmadi recently visited the Faroe Islands and met Nordic colleagues working with work environment issues – both researchers and inspectors. This brought up questions of the sharing of and learning from experiences, both what can be learned from each other when it comes to knowledge, but also how knowledge about work environments can be passed on. The offices in central Gävle are still temporary, and the public body is housed in a corner of a gigantic and fairly dull old bank building. It is clear from office chairs and computer screens that are lined up waiting for new locations and new staff that this is a temporary solution. Today the public body employs 11 people, and it will grow to having a staff of between 30 and 40 by 2020, when it will be fully operational. There is a lot of interest in the new public body, and so far Nader Ahmadi has been giving more than 30 interviews. “This is new to me, after having been a boss in the world of university colleges for nearly 20 years,” he says, and looks both happy and satisfied. Topical: Director General for the newly established public body on work environment knowledge Mynak since 1st June 2018, housed in an old bank building (above). Career: Professor of sociology. Vice rector for the Gävle University College, and former head of the Faculty of Health and Occupational Studies at the same institution. His thesis focused on how the great religions view individuality, and he has also done research on welfare measures aimed at children and families. Family: Married with one son (10). He has a 35 year-old son from a previous marriage. Born: Iran. He has lived in Sweden since 1984. Interests: Describes himself as a builder, whether it is a new decking or creating a new garden. Loves to read fiction, and right now it is The Handmaid’s Tale by Margaret Atwood. Hidden talent: Likes to shop and will gladly go with his wife as a fashion advisor in shop after shop.